With the economy showing no signs of bouncing back Ben Bernanke and the FED seem to be on the verge of releasing Quantitative Easing version 3. This new version will like the versions before it give a boost to Wall Street and line the pockets of stock brokers but little else. With Romney having declared his intentions to replace Bernanke and the election around the corner the timing of a QE3 would be suspect to say the least. Such action is sure to produce the illusion of growth by spiking the stock market just in time for the election season but the hangover for the monetary system would be a steep price to pay for such a temporary high. It seems the powers that be have no idea on how to turn things around. Their only courses of action seem to be spouting misleading statistics, hoping for FED magic cash and just plain lying when all else fails. Obama while commenting on Romney’s convention speech poked fun of Romney for thinking he somehow knows “the secret to getting the economy going again.” The comment got a laugh from the party faithful but the comment itself was very telling. The President and his followers seem to think that the economy is a mysterious thing, something no one can know for sure what will help it grow and what will not. For them the knowledge to impact it for good or ill a mystery beyond the capabilities of mere mortal men. Even to suggest that one knows he can impact business positively is apparently laughable. Even if the President’s followers feel that anyone who thinks they have the ability to impact the economy substantially beyond what Obama has tried is foolish; the reality is the keys to improving the economy are no mystery. For the economy to do better one must first make it easier to do and invest in business. It seems odd that those that would cry out against stresses on the environment that make it harder for nature to survive cannot understand the same is true for the economy. Just like in nature in order for the economy to thrive businesses must be relieved of the stresses holding them back. Also like in nature, the economy can heal itself if given the space to do so. The real mystery in all of this is how the President and his followers miss this fundamental truth. Like someone spraying a field with weed killer and wondering where all the wild flowers have gone the current administration has been attacking businesses and wondering why the economy is so bad. The concoction of economy suppressing businesscide the administration has been able to apply across the country in just three years is impressive by any measure. 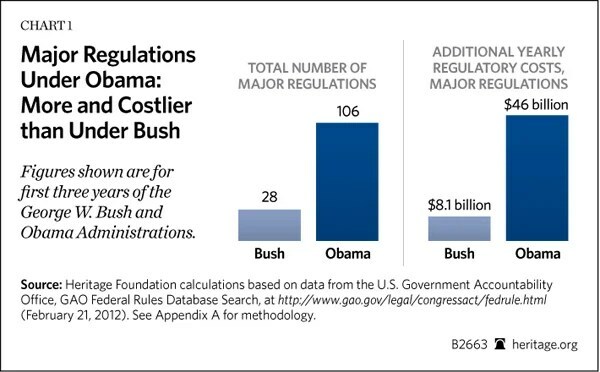 Take regulations, although Obama has claimed he has put forth no more regulations than his predecessors the facts tell a different story. As the chart below illustrates he is far out pacing President Bush. Most of Obama’s costly regulations have come from three sources: Dodd-Frank, ObamaCare, and the EPA global warming crusade. The costs noted above are as of Feb. 2012, these are costs are still rising and new ones are still coming on line. More significantly they do not include economic losses like the closing of coal plants and mines or the many opportunities not taken because of these regulations. The fact is nearly half of all businesses cite regulations as a factor in not expanding. The regulations coming out of Washington have contributed greatly to the U.S. falling to number 7 in economic competitiveness, a two position drop from the last ranking. A drop that is as significant or more so than the credit downgrades. Unfortunately this is mere reflection of what the Wall Street Journal and the Heritage foundation calls the Economic Freedom Index, something that has been falling for sometime in the U.S. but the fall has accelerated under Obama. Of course regulations are not the only type of businesscide in Obama’s arsenal. Taxes are also burdens to the businesses and the economy. The U.S. now has the highest corporate income taxes of any industrialized nation and that is just part of the problem. For businesses they must take into account not just existing taxes but future ones as well. How can a business plan out its future when the costs of doing business are unknown? The great tax increase know as Taxageddon is threatening to wipe out the profits of thousands of small businesses and create havoc among consumers as well. As if that was not enough there is the greatest regulatory and tax increase in history A.K.A. ObamaCare is coming on line. Like a one two punch from a championship fighter this deadly duo will be devastating. The Democrats for their part seem totally incapable of understanding the negative impact of their policies. That is probably because to them everything in life involves some sort of good guy bad guy fight. If someone is getting ahead it must be because they are taking advantage of others. Businesses are natural suspects in their world, to them they are just getting rich off of the poor consumer. The idea of a rising tide lifting all boats just does not fit the world view of the modern Democrat. With such a warped view of the world they see attacking businesses and undermining the economy as just leveling the playing field. If businessmen and women complain about being demonized or do not revel in being immolated or financially disemboweled it is just proof to the left that they are guilty of being enriched off the exploitation of others. Given the lefts views on business it should be of no surprise they seem oblivious to the state of the economy or the ramifications of their policies. As welfare rolls climb they pat themselves on the back and decry those who see it as a national disgrace. Even former President Clinton playing fast and loose with the facts and pulling out antisemitic dinosaurs like Jimmy Carter can cover up the fact that President Obama is the economy’s enemy number one. He has not laid the foundations of a lasting economic recovery as was his real mandate but rather led the U.S. into a forest of economic malaise. As economic stagnation settles in for what appears to be a long stay and the FED keeps rolling the dice, gambling how far it can go it can go before it plunges the country into a late 70’s inflation cycle (or worse) the call to continue “forward” with the same policies is getting ever more surreal. Excellent post. I have not seen the regulatory burden so well documented. I don’t honestly believe they want the economy to do well, they want to see business people punished, they want to see success punished, they want people to grovel at their feet – it makes them feel important and lets them forget that they cannot create these things themselves.